Ahhhh....what a way to end the holidays. I'm not a doctor, nor do I play one on TV (a little humor..what very little I have right now), but whatever I got, I certainly wouldn't want to pass to anyone else. ugh. I hate being sick. Right now, I wish I looked half as good as this little fellow to the right. It started out as a scratchy throat and each day it was something else. But Sunday, it was a full blown sinus/headache/stuffy nose/can't breathe/ache head thing. Still today nothing has changed. Well, not to lie, yesterday when I woke up it felt like someone was hammering a nail in my ear -today, that didn't happen. Although I honestly felt that if I moved my head just an 1/8th of an inch my head would spontaneously conbust. No, today, I'm just plain tired and debating if I should call the doctor or not. 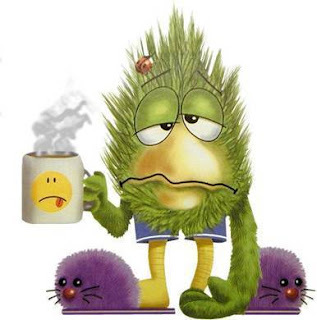 Have you gotten sick in the last month or so? Do you think it was the H1N1 flu? I don't think mine is that, but whatever it is certainly has a hold on my head. Hoping for a much better day tomorrow! Even through the holidays and being sick I did manage to work on the website a little. I wanted to change it up, fresh for the New Year, and was inspired by the website of a fellow blogger (Azure Islands...remember her guest post). But that's about all I did this past holiday week. I had so many things I wanted to do, the list is off the charts. But this year, I had no choice but to relax. So it goes. And now, it's about time to start thinking about the dreaded end of year, bead inventory count. Yeah. Do you count your year end inventory? Maybe if I didn't have so many beads I wouldn't feel so overwhelmed doing this year end task.....nah! One can never have too many beads! Well, coffee is kicking in and for now, I'm a little more awake. Guess, I should try and get some things done...and visit some fellow blogs! So how about you? 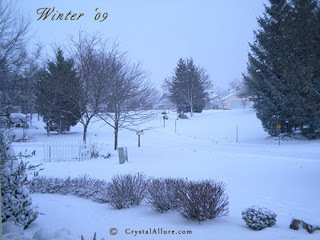 What is winter to you? I was first introduced to Heather, designer for Azure Islands Designs, from a good blog friend, Pearl over at the Beading Gem's Journal. 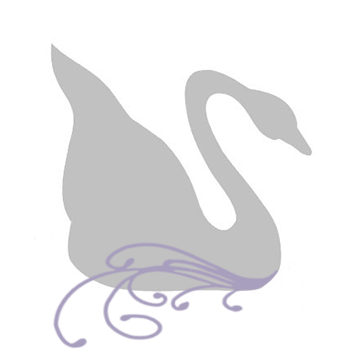 Just like me, Heather is a regular visitor of Pearl's blog and so I checked out her website. I was curious as to what type of jewelry she designed with a company name such as, Azure Islands (so peaceful isn't it?!). I pictured all this shell jewelry. I was surprised to see such a very well designed website (love her front page!) and beautiful handmade jewelry. It goes without saying I also found many pieces that I would definately wear strolling along the beach! I opened my business, Azure Accessories in September of 2006, and began designing and crafting jewelry in October of the same year…all it took was my first craft show in November of that same year, for the idea of custom designing jewelry to become a passion, which only seems to get stronger! At a show in November 2007, I was selling Swarovski crystal hearts on chains…a lady purchased a pink one for herself and began a conversation with me…to make a long story short, she thought I should make “pink” items and donate a portion of the sale to the Breast Cancer Fund. I couldn’t stop thinking about the conversation with my customer…I’ve always donated personally to organizations that mean something to me, but at the time I wasn’t donating to an organization through my business. After careful consideration I decided I would like to donate, but my choice was the Heart & Stroke Foundation! 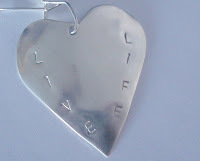 I especially love this sterling silver pendant etched with "Live Life". It reminds me very much of a bracelet I designed for the Crystal Allure Awareness Jewelry Collection. Heather explained the reason she chose the Heart & Stroke Foundation is because: My father passed away in September 1985, my paternal grandmother, in June 1986, both from heart disease and my maternal grandmother in September 1986; my paternal grandfather died in the early 70’s…both from a stroke. I have three brothers, one of my brothers, who is a twin, had a serious heart attach 10 years ago, when he was 43, he has since recovered, leading a more healthy life style. The other twin has high blood pressure, which is under control; my third brother and myself do not have any indication of heart disease so far…my donations are a drop in the bucket but they are my small way of contributing!!! While many wonderful organizations are in desperate need of donations it was important for me to choose an organization I felt strongly about. I wanted to do my small part by drawing attention the Heart & Stroke Foundation! The premise behind my Heart & Stroke Series jewelry is simple…anything I make with a heart is part of the series and when sold I will donate a portion of the sale to the Heart & Stroke Foundation. 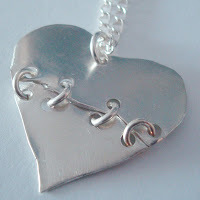 This particular sterling silver heart is a fabulous design concept and reminds me of a broken heart that has been mended and is once again beautiful! Which is probably why is it called the "Broken Heart". 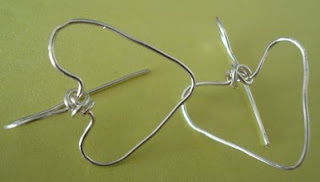 Heather cuts the heart free hand, so no two will ever be the same, into two pieces; punches holes in it and "mends" the heart with sterling silver rings. I do have to say, often, when someone purchases a heart design from me it is because they love hearts, the fact that I give a donation to the Heart & Stroke Foundation is more than not, irrelevant to them. This does sadden me because people don’t seem to understand the impact heart disease or stroke can have on our lives… I proudly let my customer know that with their purchase I will be making a donation to the Heart & Stroke Foundation! I would like to extend a heartfelt “thank you” to Stephanie for allowing me to bring awareness to the leading cause of death and disability in Canada!!! Thank you Heather for sharing your handmade jewelry designs with us and for giving back through your awareness collection. • Cardiovascular disease (heart disease and stroke) is the leading cause of death and disability in Canada. • Between 1969 and 1999, death rates due to heart disease and stroke decreased by 56%. • Eight in ten Canadians have at least one risk factor for cardiovascular disease and 11% have three risk factors or more. • Some risk factors are, high blood pressure, smoking, diabetes, lack of regular excursive, being overweight, high bad cholesterol. Remember the post about fall weddings and autumn brides? Well, the inspiration for that post came from a bride, Sarah, who was getting married in October. The fall season can be such a beautiful time of the year to get married, with all the vibrant colors. Who wants to be a June bride? I'd take autumn (or winter...which I did!) anytime! Well you might recall, Sarah had come to me requesting two more additional necklaces like the one we had on our website, the Red Aventurine Gemstone Freshwater Pearl Beaded Necklace (N040). 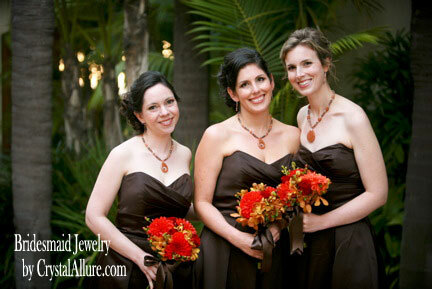 I explained it was a one-of-a-kind but suggested she consider that one for her maid of honor and have two additional Autumn Wedding Bridesmaid Necklace Sets made for her bridesmaids. That way, her maid of honor would stand out from the rest of the bridal party. Thank you Sarah for the opportunity to help make your wedding day even more special and unique! Although Sarah is not the first bride to request custom wedding jewelry from Crystal Allure Beaded Jewelry, this is the first set where I did get pictures. 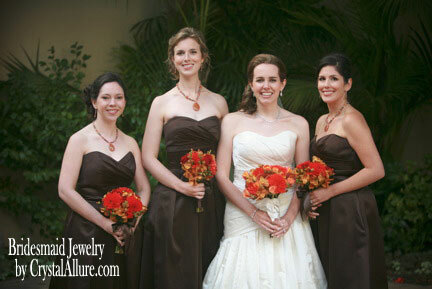 So I wanted to start sharing with you the custom wedding jewelry that I design and the lovely brides who requested them. Thank you for the congratulations. It's very nice of you to follow up. I was very happy with the pieces. I thought they worked wonderfully with our brown and orange wedding colors. The bridesmaids were very happy as well. My mother even commented that they looked like something out of the Bloomingdale's catalog - definitely a compliment! Thank you again for your help. Your design turned out perfectly! I got the wedding of my dreams. Recently completed is a custom holiday bracelet set for one of my favorite customers. The Swarovski aurora borealis crystals used in this design are actually left over beads from Mary Kay's Custom Crystal Vintage Redux 3-pc. Jewelry Set (JS100). There was a plan to use them in another necklace design with vintage beads received from her family, but when that design didn't work out, we went to plan B. Plan B, was to use them in a holiday bracelet design. 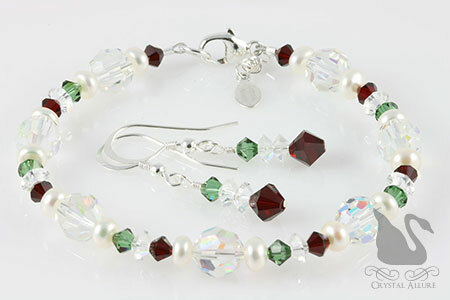 So I got to work and added some lovely freshwater pearls with some red siam and green tourmaline Swarovski Crystals to sterling silver and viola' -a festive holiday bracelet to treasure for a lifetime! What makes this bracelet set even more unique is because the red and green crystals are small enough and there are not too many in the design -you could really wear this bracelet at other times throughout the year. Just add this beaded jewelry set to either a red outfit, or a green outfit, or even a neutral shade for just a small pop of color. Finished with my signature jewelry tag. 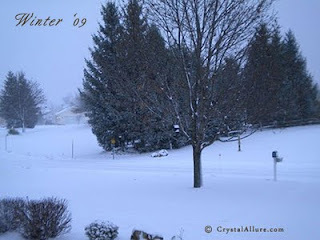 "What a wonderful 'cold-Friday-in-December' surprise...I absolutely love them!! We are planning a holiday outing tonight and they will be perfect. Of course, I have them on already. I especially like that they are festive, but not limiting and can really be worn anytime of the year. Thank you so much. You are the best!" 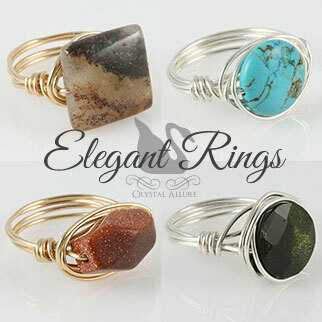 It's been a long time coming but they are finally here -elegant handmade wire wrapped rings! Styles are available in either sterling silver or 14 karat gold-fill wire, with currently seven different gemstones and/or bead rings to choose from. Personally, I'm a ring fanatic -can't get enough of them. But as we all know, buying any kind of jewelry at the local jewelry store/department store can get quite expensive. So, I have designed a collection of wire wrapped rings that are not only beautifully chic, but affordable too! Heaven knows I'll have at least one of each ring in my personal collection! This handmade ring collection will be limited in edition and some will be made upon order, so please allow a week to ten days before your order may ship out. But because each gemstone is different and the ring is wire wrapped by hand, each ring is unique. Custom ring styles are also available upon request. Get information on the Jasper Gemstone Bead Ring (R106) and the Treasure Chest Goldstone Gem Bead Ring (R104). 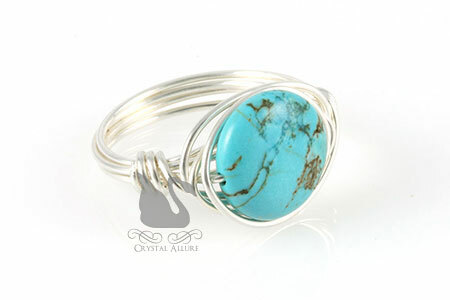 Sterling silver wire surrounds a blue green howlite turquoise gemstone to create this handmade wire-wrapped bead ring. Each stone is unique and will vary slightly from the one pictured. Howlite turquoise is actually a howlite gemstone that has been dyed to look like the more expensive turquoise gemstone. 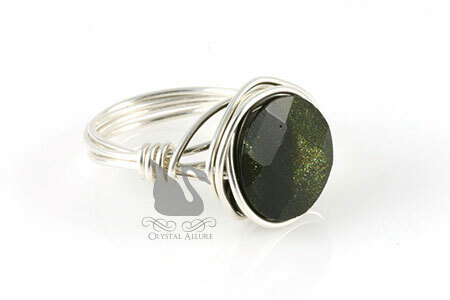 Sterling silver surrounds a shimmering green goldstone gemstone bead to create this handmade wire-wrapped ring. 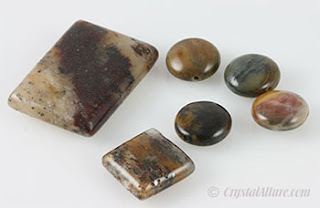 Each stone is unique and will vary slightly from the one pictured. The reflective particles in green goldstone are actually from chromium oxides rather than the copper flecks found in brown goldstone. 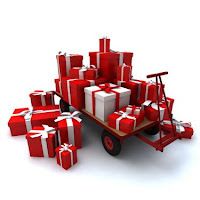 Each year we all fall into the frenzied rush of getting last minute gift(s) and if you are ordering online you have the added stress of wondering if you'll get your package in time for Christmas. Well, I want to help you out and give you the absolute last day you can order your handmade beaded jewelry from Crystal Allure and still get your package in time for the holiday. This year, that holiday order cut-off is 1:00 pm (EST) December 21, 2009. Any order placed up to that time will ship out December 21st, priority mail and is guaranteed to reach you in time for the holiday. But, don't wait until the last minute to order your handmade beaded jewelry and beaded gifts, start shopping Crystal Allure and avoid the last minute rush. I know, I know. 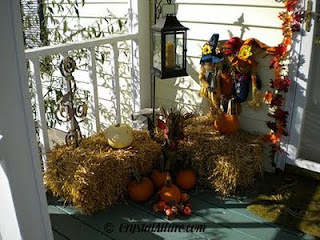 We're past 'fall' now but I did want to share with you this years fall porch scape. Each year, I change it up a little and this is only the small area to the left of our door. There are a few more fall details on the right side...for some reason, just didn't get that photo. In fact, in the last few weeks I've come to realize there were many photos I could have taken and shared (our thanksgiving day table, etc) because if you're anything like me, it's the small details that make the holidays that much better. Note to self: try to remember more pictures! Back to the porch scape. I do like to take the time each year to decorate both inside and outside, for the fall/thanksgiving and winter/christmas seasons. And I'm a BIG fan of door wreaths (again, didn't think to get a picture this year). I used to change them for every season/holiday/month or just because I love the wreath so much. I think wreaths/door decor/door details are the most important thing you can do to your house to welcome your guests as they enter it. So in this years' porch scape, I added a new old style, black lantern. It's a fantastic new feature of that corner area. I just wish I felt comfortable lighting the candle! The leaf strand around the door lights up but again, didn't think to get a picture of it at night. Throw in a few bales of hay, pumpkins in both orange and white, scarecrows and you have a beautiful and welcoming porch entry way. So do you porch scape? Tell me about it and if you have a blog, link your comment to your blog so I can check it out. Christmas is now officially 3 weeks away, but if you're like me and ordering your gifts online, the time is much shorter. That being said, I completely understand the pressure of (1) finding the right gift and (2) getting it in time. And I'm all for ways to make my shopping easier!! So I've complied a Crystal Allure Holiday Gift Guide to assist in narrowing down gift options so you choose just the right one. Included, new, in this years gift guide is a quick list of all the new beaded jewelry that is perfect for the upcoming holiday. Got a special company holiday party to attend and want to shine just enough to suit your individuality? Like to have a little fun and wear some jewelry with a hint of holiday color? Well, it's all right there in the Crystal Allure Holiday Gift Guide. You'll find our most popular stocking stuffer options with a variety of choices under each. These great little gifts are perfect to give as secret santa gifts or even to the ladies in your office. Each come packaged in a lovely organza bag and ready for gift giving -or to drop in the stocking! And for that hard to buy for person is the quintessential, can't go wrong, jewelry gift certificate. Available in $25, $50, $75 and $100 you're sure to find an amount that will fit your shopping budget. The Crystal Allure Jewelry Gift Certificate is a virtual certificate which means you will receive an email with the details of how to use the gift certificate and the code. However, if you really would like a paper gift certificate, just let me know. So don't fret about shopping, grab a cup of coffee, sit back and shop with ease until your hearts content! A few years back I had purchased these beads and although I'm pretty good at identifying beads, for some reason, these are challenging me. So, I thought I'd ask you. Now I have a few thoughts on what they are but what do you think? Are they all the same? Help me out and leave a comment with your best guess on what these beads are. The only info I have on them is that they are semi-precious. HONG KONG (Reuters Life!) - A rare, 5-carat pink diamond was auctioned off for a record $10.8 million in Hong Kong on Tuesday, putting some shine back into the world's rare and large stones market which was badly hit by the financial crisis. The stone, of a "vivid pink" hue and considered near perfect, but not quite flawless, triggered brisk bidding in Christie's autumn sales of Asian and Chinese art in Hong Kong. The price smashed the previous record, set 15 years ago in Geneva for a 19.66-carat stone that sold for $7.4 million. The pink gem's per-carat price of $2.2 million was also the highest ever paid for any diamond at auction, Christie's said. "No stone has ever been sold for $2 million a carat, we were used to ... a million dollars a carat for colored diamonds but never 2 million," said Francois Curiel, Christie's Europe chairman. "This is an absolute record that is not going to be broken for a while I believe." The stone, set in a so-called "cushion-cut" ring by famed jewelers Graff Diamonds, was just a quarter the size of the Geneva stone and not quite flawless but the stone's "vivid pink" is considered near perfect. Curiel described it as a "fabulous pink diamond, probably one of the rarest stones I've ever seen." While the South African-mined diamond isn't quite rated flawless given minor blemishes, Christie's said that these could be removed by minor repolishing. Christie's has a track-record of putting rare polished stones up for sale in Asia, given its confidence in the depth of the Asian market for the world's top gemstones and artwork. Last May, before the financial crisis began to hurt the global auction market, Christie's sold a squash-ball-sized, 101.27-carat diamond in Hong Kong for $6.2 million. Despite this, some major gems have disappointed in Asia, including a 72.22-carat "D" flawless white diamond that failed to hit its reserve price in a Sotheby's Hong Kong sale last April, falling short of its $10-12 million pre-sale estimate. While the world's most expensive jewel ever sold at auction is the "Wittelsbach" blue diamond, a 17th-century deep grayish-blue stone that fetched $24 million last year, top red and pink gemstones are also known for stratospheric valuations. The local Studio 34 will be having their annual Holiday Show and Sale on both Friday (12/4/09) from 5-8pm (invitation only) and Saturday (12/5/09) from 11-5pm (open to the public). The show will feature handcrafted works by Studio 34 faculty and local artisans (including Crystal Allure!). The studio is located at 34 Elton Street, Rochester, NY and admission is FREE. Get a head start on your holiday shopping and stop on by. Hope to see you there!